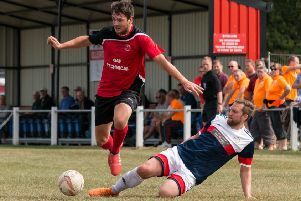 Selston made it eight wins out of eight in the EMCL on Saturday with an emphatic 7-0 win at home to West Bridgford. The Parishioners now top the table and are in inspiring form, this win the biggest of the campaign so far. The chances for the home side came right from the off, full-back Rhys Dolan shooting too high early on then Scott Taylor also going close on three occasions and Carl Moore forcing a fine save from keeper Clarke. The Parishioners finally got their goal on 42 minutes when Taylor again played a clever ball to release Sean Gregory and he squared quickly to Kyle Hempshall who slid in to register his first goal in his spell at the club. The visitors came out from the break with vigour and Simon Baldwin in the home goal had to get down sharply to stop a shot from Jurgen Charlesworth in the first minute of the second half. Selston got back on top on 49 minutes though as Gregory combined with Moore again, the skipper slipped a ball into Layton who took a great first touch to beat his man and smashed a right foot shot into the top corner to double his side’s lead. The Parishioners then scored a further goals in thirteen minutes to kill off any thoughts of a Bridgford come back. Josh Waldram made his presence known with a great run from right back, he pulled the ball back for Taylor who slipped in Layton and the winger coolly slotted home for his second of the day. Layton then turned provider, dancing past four defenders before crossing for Taylor to tap in from five yards for the fourth goal of the day. Selston’s fifth was the hat-trick goal for Man of the Match Layton. The winger got on the end of a great deep cross from Waldram and stroked home. Josh Bullock, on for Gregory, had a fantastic opportunity to get his name on the score sheet but the young winger blazed over from six yards. Ben Moore’s 73rd minute shot was blocked by Ricky Benwell and then Clarke but still managed to find its way over the line, and the scoring was rounded off by a great individual effort from Taylor who twisted the unfortunate Josh Rodgers inside out before finishing smartly across the keeper to make it 7-0.